For other Scots Colleges, see Scots College (disambiguation). Thereby Scots College (or The Pontifical Scots College) in Rome is the main seminary for the training of men for the priesthood from the dioceses of the Roman Catholic Church in Scotland. The Scots College was established by Clement VIII on 5 December 1600, when it was assigned the revenue of the old Scots' hospice. At first the college was sited in a little house in what is known today as Via del Tritone, opposite the church of Santa Maria di Costantinopoli. In 1604 it was transferred to Via Felice, now called Via delle Quattro Fontane, where a bust of the last of the Stuarts, Henry Cardinal Duke of York can be seen. The college remained there until 1962. From 1615 to 1773, the Rectors of the Scots College were drawn from the ranks of the Society of Jesus. 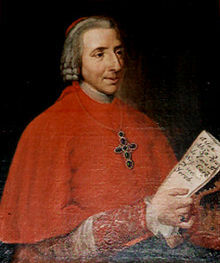 After the Jesuits were suppressed in 1773 by Clement XIV, by his brief Dominus ac Redemptor, the College was administered by a series of Italian clerics until 1800 and the arrival of Paul MacPherson, a Scot, who served as Rector for 38 years. Since then the Rectors have all been drawn from the ranks of Scotland's secular clergy. The other long serving Rector of the College, who also served for 38 years was Rt Rev. Msgr William Canon Clapperton (1886-1969) who served as Rector from 1922-1960. After his retirement he remained in Rome as canon of St John Lateran and is buried in the college plot at the Campo Verano cemetery in Rome. The College moved to its current location on the Via Cassia some 4 miles from the city centre in 1962. The new College was designed by Renato Costa and was officially opened by Pope Paul VI on 18 November 1964. Seminarians at the Pontifical Scots College in Rome spend their first two years studying Philosophy at the Angelicum. After completion of Philosophy, and depending on their fluency in Italian, they take up the study of theology either at the Pontifical Gregorian University or the Angelicum, where theology is also offered in English. Priests taking part in postgraduate theology courses continue to stay at the College. The celebration of the Feast of St. Andrew is a high point of the Scots College year. The chapel of the college houses the original tombstone of King James III and VIII. On 14 April 2016, the community of the Scots College were granted a private audience with Pope Francis at the Apostolic Palace to mark the 400th anniversary of its becoming a seminary. In 2017, seminarians from the college were invited to serve at the Easter Vigil at St. Peter's Basilica. Alexander Dunbar Winchester, (1625–1708) Apostolic Prefect for Scotland. John Paul Jameson entered the college in 1677 ordained 1685. Wilhelm von Leslie (1657-1727) Prince Bishop of Laibach. Entered the College in 1675, ordained priest in 1681. George Hay (bishop) ( 1729-1811) served as the Vicar Apostolic of the Lowland District in Scotland from 1778 to 1805. Fr George Thompson, priest, teacher and MP, studied at the Scots College in the early 1950s. Maurice Taylor (born 5 May 1926) was the bishop of the Diocese of Galloway from 1981 until 2004. John Cunningham (born 22 February 1938) was bishop of the Diocese of Galloway from 2004 to 2014. Canon John Gray priest and poet, founding parish priest of St Peter's Morningside Edinburgh. Paul Laverty (born 1957) is a screenwriter and lawyer. Studied for the priesthood but did not continue to ordination but obtained a philosophy. degree from the Pontifical Gregorian University in Rome. Scotus College founded in 1993 at Bearsden, Glasgow and closed in 2009. The Royal Scots College - located at Salamanca, Spain since 1988; formerly at Madrid and Valladolid. St Andrew's College, Drygrange in the Scottish Borders. Closed 1986. ^ Herbermann, Charles, ed. (1913). "Roman Colleges" . Catholic Encyclopedia. New York: Robert Appleton Company. ^ a b Scots College Rome. "History". Archived from the original on 13 November 2014. Retrieved 11 April 2012. ^ McCluskey, Raymond (2000). The Scots College Rome 1600-2000. Edinburgh: Birlinn Ltd. ISBN 0 85976 524 5. ^ "Pope Francis to Scots College: be courageous, merciful priests". Vatican Radio. Retrieved 23 February 2017. ^ Canon MacWilliam, Alexander (1970). "FR. ROLFE AND THE SCOTS COLLEGE, ROME". Innes Review. 21: 124–139. doi:10.3366/inr.1970.21.2.124. This page was last edited on 23 April 2019, at 06:50 (UTC).